Whether you are working out at the gym or doing your routines at home, you need a reliable pair of dumbbells. At the gym, you will find dumbbells with different weights and sizes. But at home, you can’t have a stack full of dumbbells (and you don’t even need to). Usually, anyone who wants to train with dumbbells at home needs only a few sets of dumbbells in a weight range. So how do you do weight training without having to spend a lot of money on a complete set of weights? The answer lies in adjustable dumbbells. And you don’t need to go from one shop to another looking for these. You can easily buy a variety of adjustable dumbbells online. Adjustable Dumbells – as the name suggests – are completely adjustable, easy to use and are ideal for personal weight training at home or at the gym. So instead of the weight plate being fixed to the dumbells rod, it’s fitted using a nut. This allows you to easily change the weight accordingly (when you different sized plates). You can find simple low-cost adjustable dumbbell models with plated steel plates fitted on solid rods or you can get the more expensive adjustable dumbbells such as the famed Bowflex SelectTech. This is completely adjustable from as low as 2.27 kilograms to as heavy as 23.82 kilograms using a simple dial mechanism. Shopping smart will get you the best kind of dumbbells that will work for your needs as well as your budget. With the best pair of adjustable dumbbells, you can better your weight training for any muscle group. You will also be able to enhance any strength training regimen plus gradually improve muscle tone and form. The following best adjustable dumbbells you can find in India and can buy online. In case you’re in a hurry, here are my top three recommendations for the best adjustable dumbbells in India. Still confused about which adjustable dumbbell is best for you? 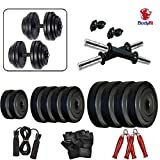 Let me help by providing detailed reviews on the best adjustable dumbbells that I found in the market (and the ones you can buy online). Below I cover eight different adjustable dumbells that you can buy online in India (or in any shop as well). I have used adjustable dumbbells myself for years and in this review article, I have done an extensive research on each adjustable dumbbell to help you make the right decision. Below is the table that shows all the adjustable dumbbells covered in this review. Now let’s have a look at the detailed reviews of each of the adjustable dumbell covered in this article. You can build your own fitness studio at home with the adjustable Body Maxx 20 kg steel chrome plated dumbbells. 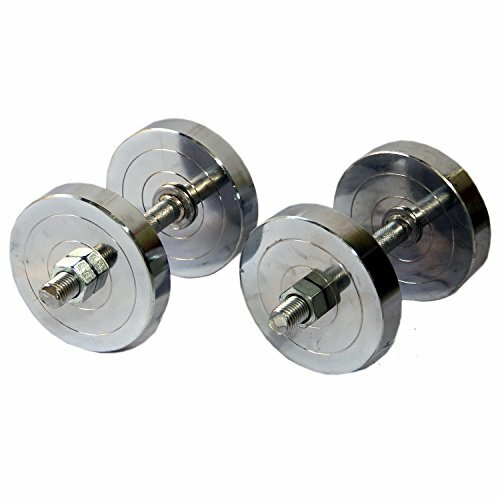 These are chrome plated weights which will last for as long as you need to lift weights. These are highly durable and very efficient; will never scratch or break even if you drop these from a certain height. The dumbbell rods are 14 inches with a rubber grip. These will let you hold the two dumbbells easily without slipping or unnecessary movements. You can use these adjustable dumbbells for building your biceps, shoulders, and back. It can be used for bench presses, shoulder exercises and more. And your purchase comes with a rope, a pair of leather gym gloves and 2 kg x 4 chrome steel weight plates and 3 kg x 4 chrome steel weight plates. 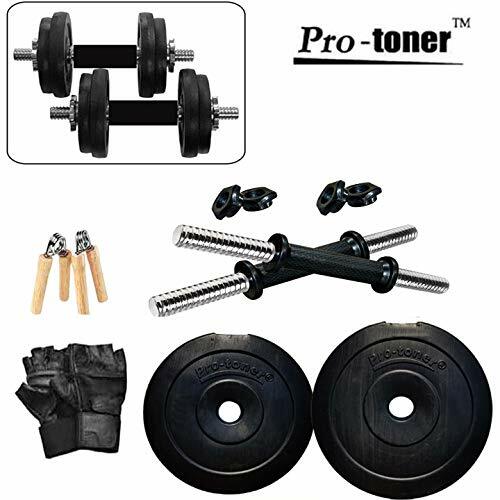 Just by looking at the Protoner adjustable dumbbells you can tell that it is sturdy and worth your money. These are adjustable dumbbells with rubber hand grippers. These grips will let you hold the heavy dumbbells easily and safely. The plates are made of very durable PVC material which will last for a long time. The plates will never scratch or dent no matter how much you let these fall. And because you need to stay safe as you use these dumbbells, it comes with a pair of very durable hand gloves. Wear these as you work out at home or at home. And when you need to change the weights, simply loosen the large nuts and remove the plates. Your purchase comes with four 3 kg plates, four 2 kg plates and two 15 inches dumbbell rods. You also get a pair of hand grippers to improve your upper body weight training regimen. The RMC adjustable plates dumbbells are made from highly durable cast iron. You can hit, drop, knock these over and these will still remain perfect in every way. These cast iron plates are adjustable, all you need is to loosen the nut on each end and you’ll have a dumbbell to use at home or at the gym. You will find these safe to use as well because of the rubber hand grip on each rod. 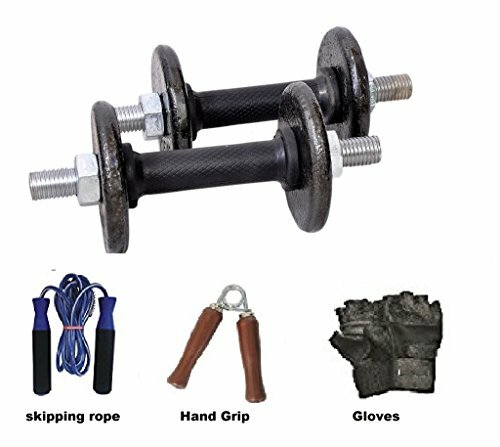 Your purchase of the RMC Unisex Cast Iron Adjustable Plates Dumbbell comes with workout gloves, skipping rope and a hand grip. Now, this is a complete solution to having complicated and multiple dumbbells for your home gym at home. 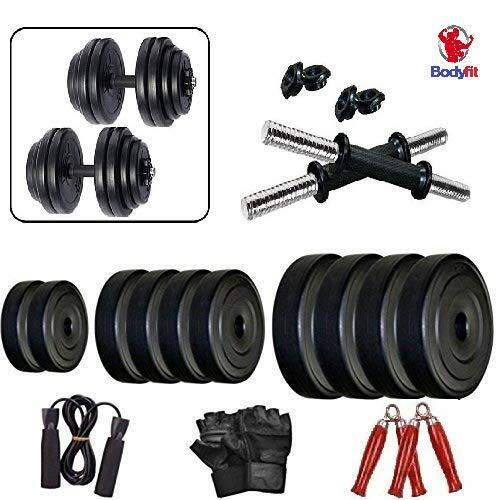 The BodyFit 30 kg Fitness Adjustable Dumbbell Set is a home gym kit with a total weight of 30 kg. You get two durable dumbbell rods with safety grip handles on each rod. The plates are made from heavy and durable PVC material which will guarantee durability for years to come. You can drop, throw or hit the plates and you can guarantee that it is very strong and will never scratch. The BodyFit adjustable dumbbells can be used at the gym or at home. You can use these to improve your fitness, strength and flexibility training for all muscle groups. This kit comes with all the things you need to set up your own home gym. You will get three sets of dumbbells, a pair of hand grips, a pair of pure leather training gloves and a jump rope. If you are looking for a dependable pair of adjustable dumbbells then these could be the one for you. Perfect your true muscle form with the Body Maxx 30 kg Adjustable Steel Chrome Plated Dumbbells. This sleek pair of dumbbells is chrome plated and won’t warp, bend or scratch when these are dropped from a height. These plates will last for a long time and can be used for any fitness regimen or exercise. You can use these to modify and strengthen your biceps, triceps, shoulders, and back. These dumbbells are small yet comfy. These are virtually unbreakable as well. Your purchase of the Body Maxx Chrome Plated Steel plates has free gym gloves and hand grippers for that ultimate weight training experience. Create your own home gym with the Fitsy Chrome Plated Adjustable Home Gym Dumbbells Set. These are premium quality weights plates that are very durable no matter how often you use these. These are resistant to chipping, cracking and peeling. These are also waterproof so you can bet that these will last for a long time. These plates are more compact than other PVC or cast iron plates. These are easy to assemble and are safe to use. You will get eight 1.25 kg plates, four 0.5 kg plates, spinlocks, and 2 grip handle. These are completely adjustable, versatile and expandable to use. The average weight that you will get is from 1.25 kg to 15 kg making this easy for anyone who would like to start a new weight training regimen. 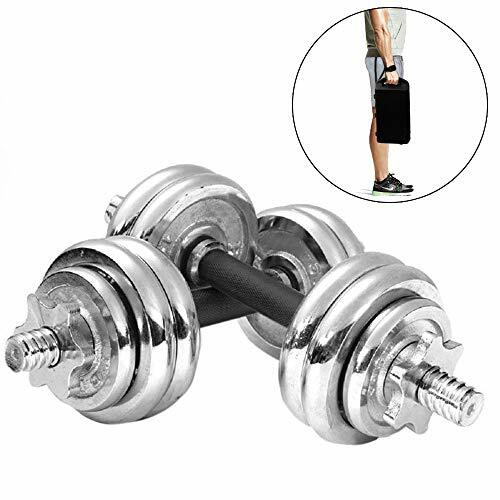 The Fitsy chrome-plated adjustable dumbbells come with contoured handles with rubberized grips. These will ensure your overall comfort and safety when you work out. The rings on each side of the dumbbell are specially contoured to make loading and unloading of the plates easy and safely. And instead of buying a complete set of dumbbells which could cost a small fortune, you can use this adjustable dumbbell set to save money. Bowflex Adjustable dumbbells come with an expensive price tag. 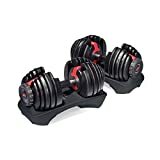 Although the quality of these dumbbells is the best in class, a price tag this high makes it unsuitable for many people who are looking to set up a small home gym or fitness studio. This pair of dumbbells is completely adjustable. Each of the dumbbells is adjustable from 2.27 to 23.82 kilograms with increments up to the first 11.32 kilograms. With its unique dial system, you can quickly switch from one routine to the next. Combine the 15 sets of weights and you get a challenging routine at the gym or at home. You can use this pair of dumbbells if you are a beginner or you are a seasoned fitness trainer or athlete. These are good looking adjustable dumbbells. 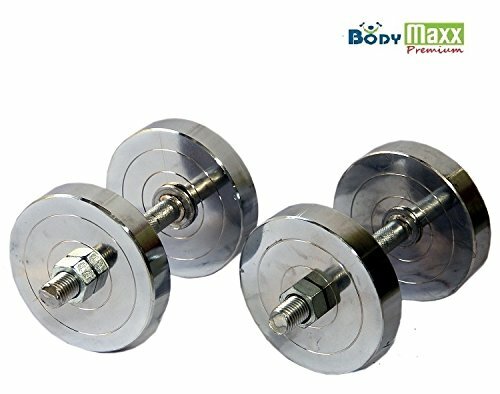 The Body Maxx 24 kg adjustable steel chrome plated dumbbells are made from only the toughest materials that will never warp, crack or dent even when you use this on a regular basis. 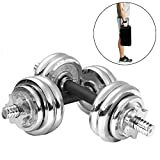 This has solid 14 inches dumbbell rods with rubberized grips so you can use these safely in any exercise or fitness routine. The plates are completely adjustable just by loosening the large nuts on each end. You can use these to work out at home or even at the gym or at the office. 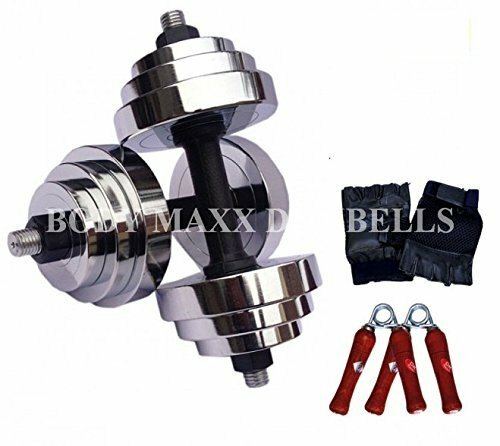 Use the Body Maxx adjustable steel chrome plated dumbbells for biceps, bench and shoulder exercises. When you purchase this, you can also get free gym gloves, hand grippers, and sets of plates (depends on the offer on Amazon). 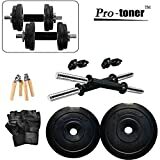 If you are looking for a set of dumbbells but just don’t have the space to store these and the budget to purchase a large set of weights then you must settle for adjustable dumbbells. There are different brands and dumbbell designs but all-in-all, these are used for the sole purpose of fitness and muscle building. And to be able to get the best results you must invest in only the best weights, like the dumbbells we have on our comprehensive list. Best Pull Up Bars in India. 10 Best Elliptical Trainers in India.